Swallow Tail diners enjoy the evening at Vancouver Urban Winery. Photo by Sue Frause. 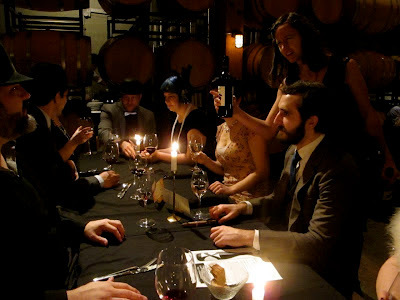 Last winter I went on a most mysterious dinner with Swallow Tail Tours in Vancouver, BC. I was in the city for the annual Dine Out Vancouver, and since I had yet to experience the company's Secret Supper Club, I signed up. Our group was told to meet at Pacific Central Station, where I arrived earlier in the day via Amtrak Cascades from Seattle. Since it was a "speakeasy" tour featuring five courses and four wine tastings at two different venues, many of the guests were dressed 1930's style. So fun! We all boarded a hot pink double decker bus and off we went. Our first stop was the Vancouver Police Museum on East Cordova. The wide array of exhibits in the unusual museum included a jail, morgue and autopsy suite. While perusing the venue, we enjoyed our first two courses of the mystery meal: Beet Salad with Blood Orange Granita, Bulls Blood Microns and Pomegranate Seeds. There was also Tomato Consomme with Pickled Cauliflower and Hijiki Seaweed, served in glass beakers. Back on the bus, we were off to the Vancouver Urban Winery, a perfect venue for food, music and dance (it recently opened as Vancouver's first commercial urban winery). The menu included Poached Hen's Egg in Red Wine Reduction, Forest Mushroom on Crostini; Pitt Meadows Flat Iron Steak, Potato Pave, Roasted Root Vegetables, Mountain Huckleberry and Rosemary Jus. The menu was created by Chef Andrea Carlson, formerly of Raincity Grill and Bishop's, now the owner of Harvest in Strathcona. The dessert was prepared by Chef Merri Schwartz. There are also two private rooms available for couples' date nights. Price is $99 per person and includes a complimentary glass of wine from the wine cellar. To hear about these invite-only secret suppers, tours and pop-up restaurants, subscribe online at Swallow Tail Tours. Membership is free.